Zambia coach Wedson Nyirenda says they will miss key striker Brian Mwila but have ample backup for Saturday’s big date away against Nigeria. And midfielder Edward Chilufya had been ruled out of this weekend’s penultimate 2018 FIFA World Cup Group B qualifier against Nigeria. Mwila, who is Zambia’s top scorer in 2017 with seven goals from eight games, will miss the Nigeria match due to injury. “When Plan A does not go well, good coaches will always have Plan B in place and we had already prepared ourselves for any eventuality,” Nyirenda said. 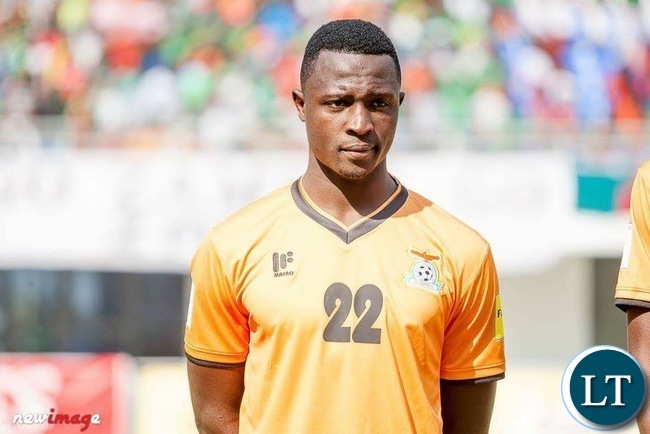 Mwila sustained a knee injury in Zambia’s 3-1 Group B win at home on September 2 against Algeria in a match he scored a brace. His injury saw him sidelined for the September 5 final leg that Zambia won 1-0 away. “I think the replacements in Alex Ngo’nga and the other boys that we have brought into camp can do the job and do wonders for the team,” Nyirenda said. Nyirenda depth of attacking options also includes Orlando Pirates striker Justin Shonga, Fashion Sakala of Spartak Moscow and Patson Daka of RB Salzburg. Meanwhile, Chilfuya of Djurgardens in Sweden will miss the Nigeria game due to an administrative matter at the club. The Zambia Under-20 midfielder is set to be handed a professional contract when he turns 18 on September 17 just four months after he joined the club as an overseas developmental player. Chilufya also missed Zambia’s September home and away dates against Algeria due to the same administrative hitch. He joins Mwila and Emmanuel Banda who will both miss the Nigeria date due to injury. Meanwhile, Zambia left Ghana for Nigeria on Wednesday after their three-day camp in Accra. I wish he had played in this one! Wonder??? Zambia want to come and beat Super Eagles of Nigeria in Nigeria? It is impossible. I have a bad feeling about this. Mwila ‘s absence will be a MAJOR blow, this young cat is deadly in front of goal. Zambia is LOSING this game! Nigerians will be lethal with their counter attacks, that is where their goals will come from. Nigeria 1-2 Zambia!!! This ia Zambia’s time to go to the World Cup..Nigeria is just escorting us and this is where their journey ends.. In fact, a weak South Africa for that matter! Again we will sing our favourite song ,title of the song is NEXT TIME. Football is the game that is played by each team field 11 players on each side and its played on the pitch not in the media. The result can go either way. Its not over until the final whistle. I don’t care what others rate the Super Eagles but the bottom line is their players are jus human and beatable even at home. The Super Eagles humbled the Sipolopolo at home ( Levy Mwanawasa Stadium in Ndola) so what can stop our boys doing the same. Come Saturday the Kipolopolo shall carry the day. I urge the Technical bench, the players, supporters and the entire NATION that the impossible can be turned into something possible lets believe in ourselves. Zambia always raised to the occasion when it matters most. Sipolopolo is good and should not be underrated. However, Zambia does not have the team that can beat the Super Eagles for now in a competitive match. Zambia team is youthful but the Super Eagles too is a blend of youthful, tested and experienced team. Both teams know what is at stake. Zambia will lose again to Nigeria. I watched both legs of the Zambia versus Algeria game and the major thing I noticed is that the new Algerian coach is not good. He has made the team completely rudderless and without rhythm. In fact, Cameroun will beat them this Saturday and even a weakened Nigerian team will beat them at home in November (after securing the Russia 2018 ticket this Saturday). Ironically, this poor Algerian team (the one Nigeria beat 3-1 was stronger and more motivated) has given the Zambians false hopes. I can only LOL. What is it with Wedson Nyirenda and Ngonga that makes Nyirenda to be calling Ngonga all the time when the striker never scores goals for the national team?